Development of high-pressure apparatus and control systems for the synthesis, thermobaric treatment, and sintering of superhard materials. Improving the technologies for manufacturing the large diamond single crystals with special properties. Improving the chemical vapor deposition (CVD) technique for the polycrystalline and homoepitaxial single-crystal diamond films on the boron-doped diamond substrates. 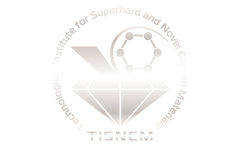 Development of technology for the thermobaric treatment of superhard materials. A principal scope of the department is growing the large diamond single crystals that have no natural analogues: “nitrogen-free” superpure, and semiconductor precisely doped by boron. Self-designed growth units are applied in the research and pilot production. A promising research direction is further modification of diamond single-crystal films growth technology using a CVD technique. A universal high-pressure growth unit (model УРС-01/В). A CVD growth unit (model BJS 150). High specific resistance - up to 1012 Ohm•cm. Color - light blue to black. a) Matrix of sensible elements of temperature gauges produced from a plate of boron-doped diamond single crystal by a group technique. b) 0.5x0.5x0.2 mm diamond low-inertia sensible element of a temperature gauge. Products from semiconductor diamond single crystals. Thermobaric treatment designed in the department effects the brown and yellow initial color of several types of natural diamonds with weights up to 20 carats, turning them into colorless, fantasy yellow, green, pink, blue, and orange colors, thereby improving their appeal to consumers. b) Color after the treatment.